This summer I’ll be involved in a great free course for young people aged 11-15. 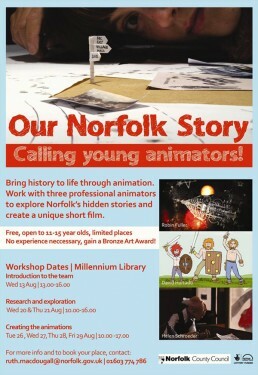 The Our Norfolk Story project is set to bring history to life through animation as participants work with three professional animators to explore Norfolk’s hidden stories and create a unique film. No experience is necessary and those taking part will gain their Bronze Art Award. The workshops are also running at Thetford and Kings Lynn libraries. Check them out for dates and details!